Connect beginning consonant blends and digraphs and their sounds by "filling the house"! Similar to "bingo" and "lotto," playing the Tiger Tuesday Beginning Consonant Blends and Digraphs Fill-the-House game requires kids to learn the associations between 2-letter consonant blends and digraphs (some trigraphs are introduced in the game as well) at the beginnings of words and the sounds they make in order to win. In no time at all, kids naturally take the first step on the path to develop integral phonic decoding skills. For 2 to 12 players or can be used one-on-one. 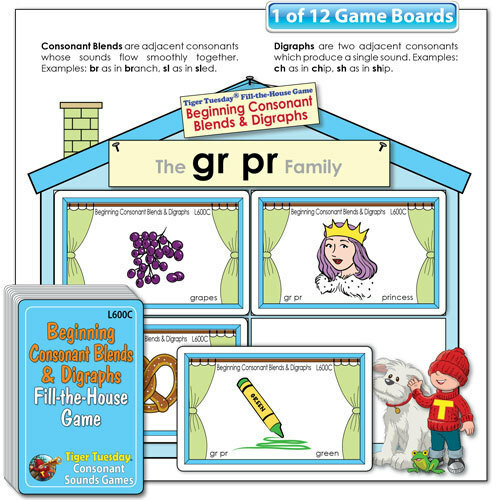 Buy Fill-the-House games L600B (Ending Consonant Sounds) and L600C (Beginning Consonant Blends and Digraphs) and mix the "house" and "window" boards as children learn for more challenging practice!